The moss Physcomitrella patens. (Credit: AG Reski / University of Freiburg im Breisgau) Moss, that dark green, short, furry plant that seems to grow spontaneously in dark, moist spaces, has unexpectedly shown up as a kind of surrogate mother to human genes, able to read human genes and manufacture the proteins encoded on them! This finding, made by Martin Fussenegger, Professor of Chemical and Bioengineering at ETH Zurich and others at the University of Freiburg im Breisgau, is a 450 million year old reversal of fortune! That's when moss Physcomitrella patens underwent the change from living in water to living on land -- 45 million years ago. After adapting to its new environment on land, the genetic structure of moss has never altered, but this is apparently the first time anyone has even thought of testing its response to human or any other foreign gene. Normally, the further away the gene structure is from the foreign organism, the more the organism would have to adapt to the gene. 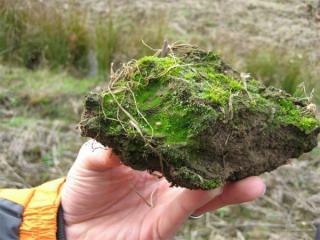 But in this experiment, the gene was directly implanted into the moss without any adaptation and the moss read the gene. Ralf Reski, Professor of Plant Biotechnology at the University of Freiburg im Breisgau, suggested that is because the moss had stayed primitive, and that other life forms had undergone more adaptations and developed more sophisticated protein processes. This finding is not a modest discovery. The moss can be used as a low-cost way to manufacture therapeutic proteins for treatment of many diseases that now use expensive mammalian cultures to produce them. The mammalian cultures require a constant body temperature, as well as a continuous supply of nutrients and oxygen. But the moss Physcomitrella patens needs little but water, nutrient salts and some light. Insulin production, now not meeting the global demand for it, will certainly be one of the first technologies to benefit from the moss Physcomitrella patens finding; its cultures can even be grown in a bioreactor. Additionally, using moss cultures to create the insulin may enable less developed countries to produce these and other therapeutic proteins. Showcase Your Shining Invention For Radio Shack’s Make It Glow Contest!